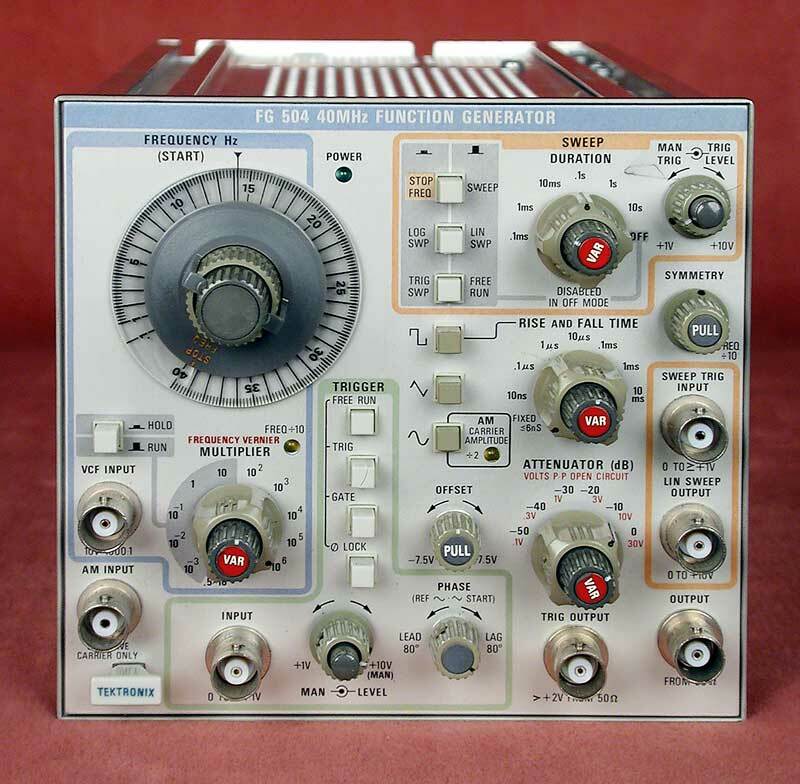 The FG504 Function generator provides low distortion sine, square, triangle, ramp, and pulse wave forms over the frequencies from 0.001 Hz to 40 MHz in ten decades. A user-definable custom frequency range is also available. 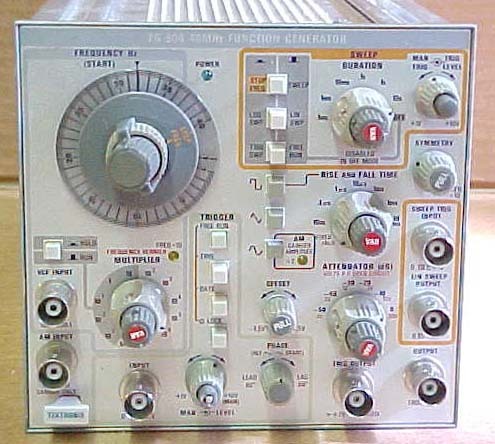 The FG504 may be swept between the START and STOP FREQ. dial settings with a linear or logarithmic sweep. The output may be phased locked, gated, or triggered for a shifted ±80º from the triggering wave form. The symmetry of the output wave-form may also be varied. For slower frequencies, the output may be held at any level by pushing the front panel button labeled HOLD. A voltage controlled frequency (VCF) input controls the output frequency from an external voltage source. The output frequency can be swept above or below the selected frequency, to a maximum of 1000:1, depending on the polarity and amplitude of the VCF input and the selected output frequency. Provision is also made for amplitude modulating the sine wave output from an external source. Requires two bays in a TM500 series power module for operation. Threebasic waveforms, Plus a Wide Range of Shaping with Variable Rise/Fall Times and Symetry Controls. The output of the FG 504 can be phase locked, gated, or triggered by a reference signal. This lets you convert from one waveform to another, such as pulses to sine waves, as well as adjusting phase relationships. Post attenuator offset enables use of the full +-7.5 V offset range with small signals. The FG 504 output can be swept, or amplitude or frequency modulated by external signals. In addition, the FG 504 can supply internally generated linear or logarithmic-swept frequencies of up to a 1000:1 range with convenient control of start and stop frequencies. The FG 504 also provides trigger output , external voltage control input, and sweep output.